How would be your dream kitchen? Let BHG helps you makeover your kitchen with $25,000 in cash. All you have to do is enter this BHG $25,000 Sweepstakes at www.bhg.com/25kfall online now through January 4, 2018. One lucky grand prize winner will receive a check in the amount of $25,000 that can be used to renovate his/her kitchen. What You Need To Know About The BHG Dream Kitchen $25,000 Sweepstakes At BHG.com/25K? Eligibility: The BHG Dream Kitchen $25,000 Sweepstakes is open to legal residents of the 50 United States and the District of Columbia, 21 years of age or older. Sweepstakes Period: Begins at 12:01 a.m. CT on August 1, 2017 and ends at 11:59 p.m. CT on January 4, 2018. Random Drawing: On or about January 11, 2018, Sponsor will conduct a random drawing from among all eligible entries received and combined from all Websites throughout the Sweepstakes Period to select one potential winner. Grand Prize (1): A $25,000 check. Winner’s List: For the name of the winner, available after 2/4/18, send a separate, self-addressed, stamped envelope to: Winner’s Name, The $25,000 Sweepstakes, 1716 Locust St., LS 321, Des Moines, IA 50309. Requests must be received no later than 3/4/18. 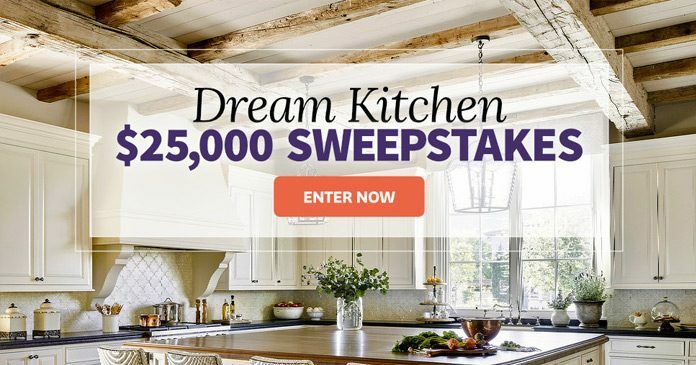 For more information on the BHG Dream Kitchen $25,000 Sweepstakes, including official rules, visit www.BHG.com/25kfall now! This would be a great prize for major remodeling of my house. I’m retired and my house needs major repairs and a new driveway so bad. This would be so great,but never won anything in my lifetime, but who knows maybe I’ll get lucky in my old age!! we have a huge mold problem retired/ not insurance covered. need this money for getting it cleaned. almost unlivable in our nice home and cannot find it. Our 100 year home could use upgrading in kitchen and bathroom to accommodate a wheel chair since I juat had back surgery. My husband hasn’t had a job for 20+ years. We could use the help!! My galley kitchen is so tiny only one person can occupy the space at a time. Pots and pans are on top of the cabinet as I have very limited cabinet space. I look at the beautiful kitchens in your magazine and dream. We live on a farm and income does not reach in my kitchen. There is so much dirt and dust every day and I need a new kitchen. I just opened my Better Homes & Garden magazine and seen this $25,000 Sweepstakes to use toward a Dream Kitchen. Wow what an answer to my prayers. We have been wanting to remodel our kitchen for a very long time, but has been put on on hold due to lifes unfortunate turns. So, I decided to give it a try an enter & I will keep my fingers crossed & pray that if it is meant to be it will happen. Love the ideas and suggestions in your monthly magazine. I just hope whoever wins the sweepstake really appreciates and deserves the opportunity. more, thanks for the offer. and contest. BHG has been a great magazine. My kitchen desperately needs an update! Be my answer to all my prays, before I can rest, knowing that my Whanau and mokopuna are living in a complete Whare , with all needs to a better life. First of all I LOVE, LOVE, LOVE BHG magazine and I am always referring stories, recipe’s and all the flower garden ideas you have to all family and friends. I am scratching together money now to pay for another years subscription due to not working for the last month and a half. Anyhoo the reason I would love a new kitchen is mine is in rough shape and not very handy to cook in the way it is. I am 57 years old and never lived in a new or even close to new home. At this time I am living in the home I was raised in and it’s over 100 years old. We do the best we can to update things around here but being farmers and being self employed time and money makes it pretty impossible. Well I’ve babbled enough! Thank you so much for putting out Better Homes and Gardens magazine, it’s Awesome!